As Anime Expo 2018 draws near, we’ve collected a bunch of important information below, so please be sure to get familiarized with all the new updates for this year and make preparations for a super busy and fun time! Please be aware that the various entrances have various operating hours. Please refer to the Hours & Maps page for more info. We highly recommend coming early to pick your badge if you can, so that you can make the most of your time at Anime Expo! If you missed the mailing deadline, your badge got lost in the mail, or you to pick up your badge in will-call, please go to the Registration Area located in Gilbert Lindsay Plaza. For details on how to pick up your badge, please see Step 3 on our “How to Attend” page. Once you have your badge, lanyards, bags, and program guides can be picked up in the “Swag Bag Pick-Up” area located by South Hall, off Figueroa St. 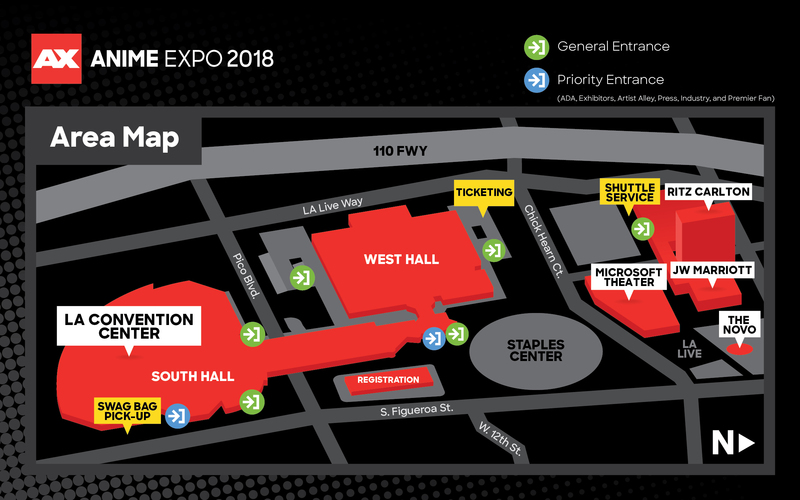 If you’re planning to participate in the ONE PIECE Puzzle Hunt and/or attend one of the many amazing events taking place in either Microsoft Theater or The Novo, please be aware that you will need to pick up your ticket at the Ticketing Booth. To make the most of your time at Anime Expo 2018, we highly recommend picking up your will-call tickets as early as possible! Bring your Anime Expo badge, the confirmation email from Showclix (printout or via mobile device), and a valid photo ID showing your date of birth. Go to the Ticketing Booth, located at the Top of Main Stairs to West Hall off Chick Hearn Ct. It is highly recommended to pick up your tickets at least 3 hours before the start of the event so that you will have enough time to note the list of restricted items, store belongings, and purchases in either your car or bag check, or take care of any other personal business prior to check-in AS WELL AS to allow sufficient time to get in line and go through the security check at the doors to the venue. AX Ticketing Volunteers will issue your ticket, as well as your bonus item(s), if applicable. Super Big Important Update for AX 2018: RFID Badges! Make sure you have your badge on hand before you enter the security line. This will help reduce slowdowns in the building entry process. If you are carrying a prop, be sure to visit a Weapons Check booth prior to entering the building entry line. Weapons Check booths are located outside of the South and West Halls for inspection and tag. Proceed through Security, choosing no bag line or general bag check line as appropriate. If you have a bag, simply place it on the table for inspection. Do not leave any bags unattended. Please note: Clear bags, small clutch purses, and having fewer bags overall are highly recommended to decrease time spent at Security. Once you’re through security, proceed to an entry portal and “tap in” your badge. Wait for the green flashing light and beep before moving forward. Now that you have entered the event area, you can enjoy Anime Expo without having to go through multiple security checkpoints! Remember to tap out when you exit! This will allow you to easily return through security without having to go to a Badge Help Desk. If you find are need of assistance with the convention area entry process, please find an Access Control volunteer in a red vest. With over 100,000 people at AX interested in many of the same things you are, expect lines for panels, autograph sessions, food, buying merch at booths in the Exhibit Hall, and more. Be cognizant of which panel rooms will be cleared between an event and which ones won’t. Check the program room policies and/or event descriptions for more information. Remember, there’s only so much time in a day (or weekend). We work very hard to bring a wide variety of events, panels, and activities to Anime Expo. As much as we’d love to share them all with all of the attendees, it’s likely that you won’t be able to do or see everything. With multiple events and panels running at the same time, you may have to make some hard choices. Wear comfy shoes! The Exhibit Hall alone is equivalent to the size of You’ll likely be doing a lot of walking and standing around (in lines), so be sure to wear comfortable shoes. (Plus, use insoles, especially for cosplay-specific shoes.) Attendees walk about 5-10 miles per day. Bring sunscreen (and maybe a hat, too). Most lines are located outside of the building, and while they are tented, it’s possible you may spend some time in the sun while walking around. Set aside money for food and bring a refillable water bottle. With food trucks, restaurants, and grocery stores nearby, there’s plenty of options no matter what your budget is. There are also water fountains located next to just about every restroom in the convention center. Try to get some rest. We know you’re very excited for AX and want to make sure your cosplay is perfect, but losing sleep before the event even starts is not a good way to prepare for multiple long days of being on your feet. Don’t forget, we’re here to help! Visit an Information Services booth if you have any questions. We also have a number of services available for your convenience such as bag check and the Quiet Lounge.